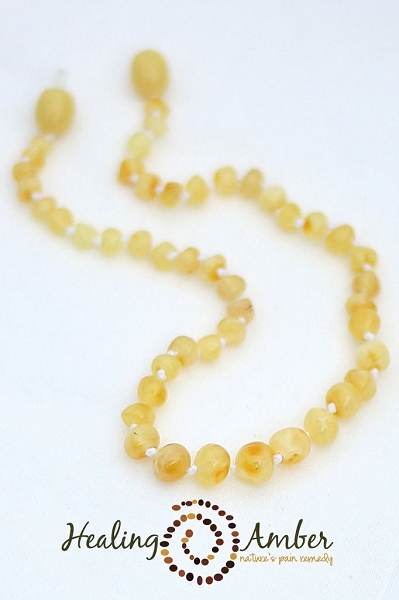 Material: Natural 100% authentic Baltic Amber is used to make Healing Amber products. Genuine Baltic Amber contains 3-8% succinic acid (and only Baltic Amber). There are many sites that claim one is better then the other. Healing Amber have not been able to find any true studies to prove that one colour has 3% and another has 8%. Many people think that the lighter the colour the better, but many others say darker is better. Lucky for you (and us), ALL of the Healing Amber amber has had rave reviews for helping with pain!! So, please, buy the design that you love the most. If you still aren't sure, we have many different designs that have several different colours so you get the best of both worlds!! 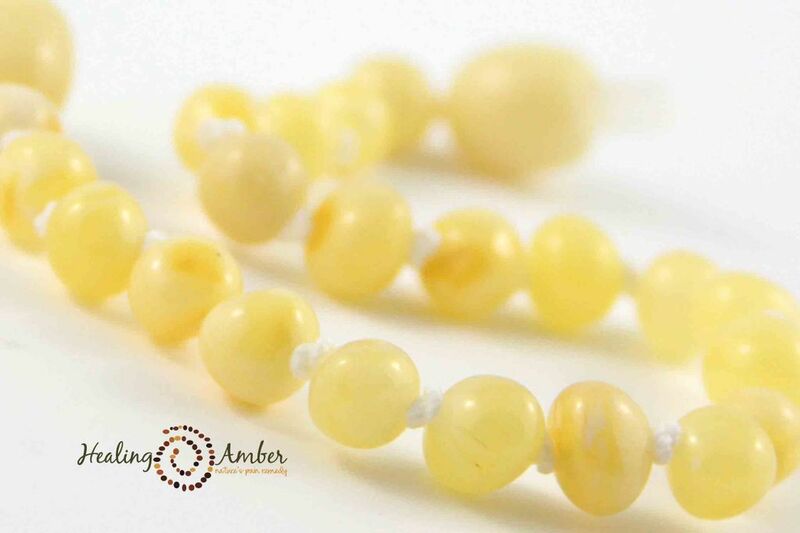 All of Healing Amber's amber is �raw� amber. It is in it�s original state and has not been heated, treated or altered. There are 2 different styles, polished and unpolished (which we call raw). All of the amber starts out as a matte/raw finish and to get polished beads, they are tumbled in a container with teeny glass beads that give it a shine, kind of like using sandpaper. Most raw/matte finished amber will become polished over time with wear. They all have the exact same effectiveness as they are all genuine Baltic amber in its natural form! There are lots of claims that there is a lot of fake amber out there and there is!! Most of the fakes are the large pieces with inclusions (bugs etc) inside. These sell for top dollar!! The amber products that we sell, are small pieces of amber that you wouldn�t find in an expensive jewelry store, collectors site or museum. Our products are made from the smallest of amber pieces. Think of diamonds, the smaller the piece, the value goes way down so there isn�t any real reason to create fakes for them. If you would still like to test your amber, use � cup of salt and 2 cups of warm water ~ mix well. Place your amber in and it will float. Rinse all of your amber after you take it out of the salt water. Baltic Amber is effective when wearing it, not ingesting. Please don�t ever place in your or your child�s mouth. You can�t overdose on it, but it is a choking hazard when in your mouth. Nope, what the sun does is warm it, which softens it, which increases effectiveness for the time being. The same way that baths and showers do! Amber doesn't need any special treatment, it is what it is and works when against your skin. Wipe it with a damp cloth�. simple and effective.